Do you wake up each morning confused what you’re going to work on today? Do you spend your day being ‘busy’ but by the end of the day you feel you’ve not achieved anything important? Do you feel like you’re carrying far too many responsibilities and can’t give each one it’s due right? Not to worry, ProductiveMuslim is right here to help. 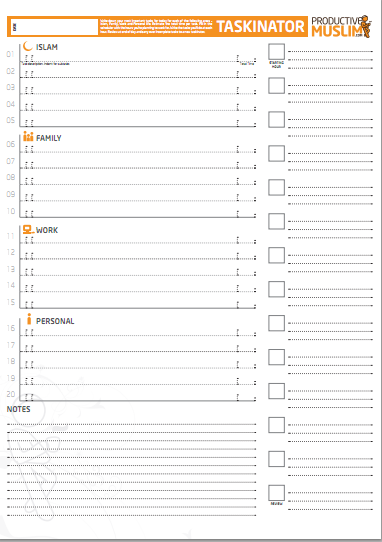 Introducing the ProductiveMuslim Daily Taskinator – Your one sheet hack for a much more fulfilling life inshaAllah. How to use The Daily Taskinator ? IMPORTANT NOTE: Make sure you schedule your most important tasks (and most challenging) to the early hours of the day. Prophet Muhammad (Peace be upon him) said “O Allah, bless my Ummah in its early hours”. The time after fajr has so much ‘Barakah’ (blessing) that you’ll be amazed at how much you can achieve in these early hours. After popular demand, we’ve brought the old taskinator back. Click here to download the previous version of Daily Taskinator.